Hey, guys, this is the second part of the series on the power supply if you haven’t read the first part (which is required to understand this part) of the series click here. This is the simplest part of all in which we are going to see and understand power requirement of your project and opt Switch Mode power supply or Linear regulator for your application. We all are very well aware of LM78XX series of linear regulators, we throw them everywhere we could, they are cheap easy to setup and all in all very good option. These need a minimum amount of external components. These regulators are ideal where a clean DC power is required with a minimum amount noise like when sensitive low voltage reading are taken for medical application, here power efficiency is not the major concern. But they have their limitation like they have low current supply capability, needs huge heatsinks to keep them cool, and they have a fixed minimum voltage called as drop-out voltage. TIP: We can use LM78xx and LM79xx series in parallel configuration get more current output at the same output voltage, but make sure the input power and output power is balanced or only one regulator gets loaded which may also damage the regulator. This shows why wee need to keep LM7805 input voltage higher than 7v. 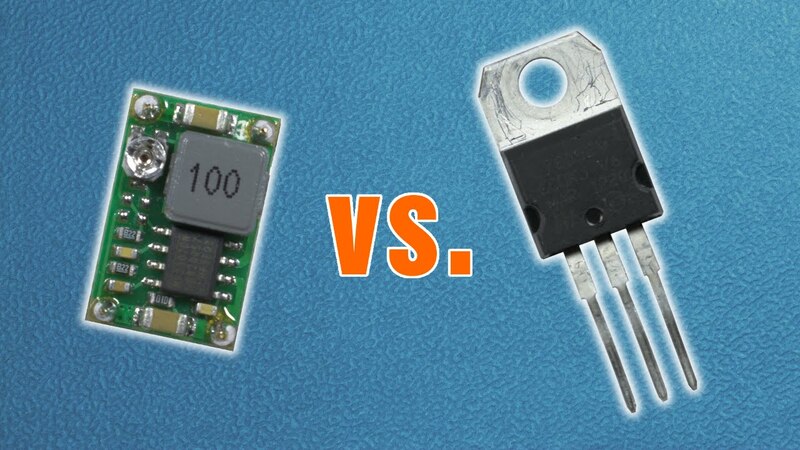 There are LDO’s (low drop-out voltage) regulators which will work even low as few milli-volts of the output voltage but they too have their limitation. As we saw previously they are highly inefficient this makes them unideal to be used in a mobile application. We will try to understand SMPS by seeing some examples. Now let us consider you are working on a smart watch, where battery life is very essential, you have to highly optimise the usage of the battery, we here need a power supply which will work with the variable input voltage (when the battery discharges) and gives stable output voltage over wide range of input voltage. This kind of application, screams switch mode power supply. We here might use a SEPIC converter (a type of SMPS) which is a combination of Buck & Boost converter types hence SEPIC works with wide range of input voltages also have high efficiency. They also are ideal where we need a high amount of current at low voltages. The best example is our common Computers SMPS this have a verity of output voltages with high current capabilities. This kind of sources are notoriously noisy and cannot be used where low power measurement are taken because the noise produced by the SMPS will overshadow the original signal. You will find many ways to overcome the limitations for any of the regulators but just make sure if it’s worth it.